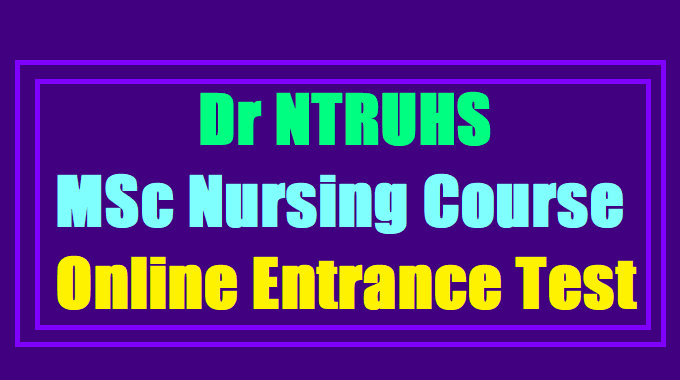 Dr NTRUHS MSc Nursing Course Online Entrance Test, Hall tickets, Results 2017/ Dr NTRUHS MSc Nursing Course Online Entrance Test 2017: Dr NTRUHS MSc Nursing 2017- Notification for Online Entrance Test in Andhra Pradesh: Common Computer based (online) Entrance Test for Admissions into M.Sc. (Nursing) courses available in Andhra Pradesh State for the academic year 2017-18. Application forms through online are hereby invited from the eligible candidates for admission into MSc (Nursing) courses through Common Computer based (online) Entrance Test for the year 2017-18 for the seats of Competent Authority Quota in Colleges located in Andhra Pradesh State affiliated to Dr. NTR University of Health Sciences, Vijayawada. http://drntruhs.org from 31.08.2017 to 11.09.2017 upto 5.00 PM only. The online application can be filled through any computer with internet connection (home/internet café/net center). Age: Both the Service and Non-Service candidates should not have completed 45 years of age as on 31st December of the year of admission. For candidates belonging to SC and ST's the maximum age limit shall be 48 years. Both women and men candidates are eligible to apply for the M.Sc (Nursing) as per GO .Ms. No. 77, HM & FW (K1) Dept, dated 13.06.2013. Regarding male candidate, admission will be as per G.O.Ms.No.79, HM & FW (K1) Dept, dated 17.06.2013. The candidate should have passed B.Sc., (Nursing) /B.Sc., Hons (Nursing)/Post Basic B.Sc., (Nursing) from an Institution which is recognized by the Indian Nursing Council to admission in M.Sc(N) copy with minimum of 55% aggregatemarks and 5% relaxation of marks for SC and ST candidates. Must have secured not less than 45 marks in the Entrance Test. In case of SC and ST candidates, minimum marks shall be not less than 35 marks. Candidate should be a Registered Nurse and Registered Midwife of Indian Nursing Council for Service and Non--Service candidates. a) Minimum one year of work experience after Registration of B.Sc., (Nsg.,) course as on 31-08-2017. Note: Experience Certificate once submitted is final. No alterations/ no revised service certificate will be accepted after submission of application. The candidates who have not acquired relevant service and not submitted requisite service certificate, such applications will be rejected and no further correspondence will be entertained. Therefore candidates are advised to check the application before submitting. Physical fitness:The candidate shall be medically fit. The candidates who qualified Post Basic B.Sc. (Nursing) from IGNOU through distance education are also eligible, if the study centre is recognized by Indian Nursing Council. The candidates are advised to download and read the (1) Prospectus of the course (2) Instructions for filling online Application (3) Sample of filled-in Application available in the website before filling the online Application. Registration Fee:- The Registration fee is Rs.3,000/- + Bank charges, (Rs.2,700/- + Bank charges for SC/ST candidates) to be paid through online. Note: 1. Application forms received without copies of the required Certificates, Scanned Photo, pass port size photo with attestation of Gazetted officer, without signature at declaration area incomplete applications, applications received after last date and time and applications of ineligible candidates will stand automatically rejected. 2. The University holds no responsibility for Postal delays / Loss in Transit. Entrance Test Center: Online Test Centres will be at three centres viz., Hyderabad, Vijayawada and Visakhapatnam. The Hall Ticket will contain date, time and the Name of the allotted Test center. Date and Time of Online Entrance Test: MSc (Nursing) Courses on 24.09.2017 from 10.00 AM to 11.30 AM. Candidate has to report at 09.00 AM sharp at the respective Entrance Test centre.